This bathroom remodel was designed for a baby-boomer couple in Austin. Previously, in order to reach their shower, toilet and bathtub, the homeowners had to step onto a raised platform. This was a safety concern for the couple, and a potential barrier to remaining in the home as they age. Our design firm designed the new space to be a beautiful contemporary space that is also barrier free and accessible. 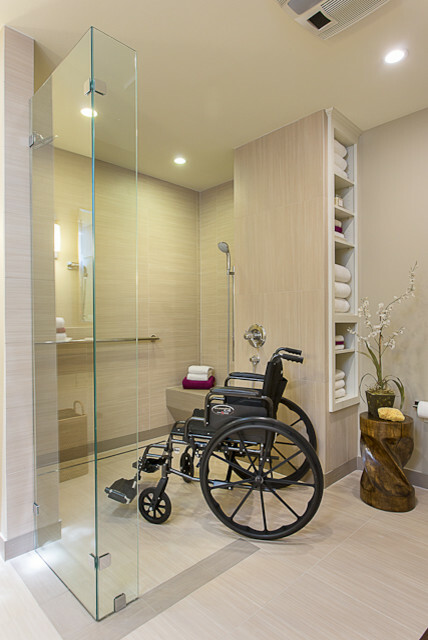 The bathroom includes many universal design features such as a roll-in shower, a linear drain, a built-in shower bench with a nearby hand-held shower head, designer grab bars, European vanities, and improved lighting. We are doing a similar project! Which grab bars did you choose? Thx! They are Kohler. Good luck with your project. They look like the Kohler Purist grab bars. Available in a lot of sizes and finishes. What is on the walls of the shower?